I'm rewatching DS9 and have been watching a lot of the Dominion war battles. I see a lot of the Galaxy class ships in the battles. I don't recall seeing any of the sovereign class ships in any of the battles, but I'm sure they were present. I realize that the defiant is tough, has a lot of weapons, etc. I see it win a lot of what appear to be unrealistic battles, but that's for another discussion. I can't help but wonder if the Defiant went up against a ship like the Enterprise E who would win? I realize the Defiant is more manueverable but the Enterprise is so much larger and more powerful...I just can't figure out how the stack up. If I think of boxing for example. Even though a middleweight is quicker, more agile, etc. a Heavyweight could knock out a middleweight with one punch pretty easily, which is why there are weight classes. I'm not sure if this analogy fits here, but I wanted to throw it out. So my question is in terms of battle only which class of ship is better suited and how do they stack up against each other? Please include hull strength, shield strength, armament, types of weapons, amount of weapons, etc. anything that would help with the analysis. The defiant is a small tactical ship, 4 of them would probably not survive against a sovereign class ship. Now a Sovereign class ship. Now to continue, the pure firepower of a sovereign class vastly out proportions the Defiant. On top of that the shielding will be multiple times more powerful, on a massive ship like a sovereign class as it will have far more power available. Finally Sovereign class ships did not engage with in direct combat with the Dominion, and the only one we know for sure that was built during the war was the Enterprise E which was busy running diplomatic negotiations, and was mostly unbattle tested, as we see in First Contact its the first time they take the E into combat. the Defiant-class is characterised as a "limited role weapons platform". and had an emphasis on defensive capabilities following the losses at Wolf 359 (source). 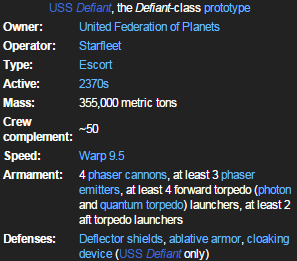 The only thing the Defiant class has over the Sovereign class is ablative armour a cloaking device (only the Defiant itself though) and phasers with a higher combat yield. All other statistics indicate that the Sovereign, with just overwhelmingly more firepower, is the superior ship when it comes to battle. The Sovereign class was used in the Dominion War. Very limited use seeing as they were so new a ship and costly to build. But when used they did very well against the Dominion forces. The Sovereign is a capital ship and pride of Starfleet. When first introduced into the fleet it was the most advanced and powerful ship the Federation had. Until the Achilles class come along. 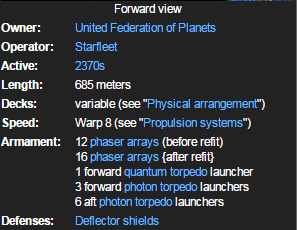 I think a Defiant is more powerful, those phaser cannons rip through shields basically, DS9s Defiant can destroy a Jem'Hadar ship in one shot. I’m sure they were building the Sovereign class ships they built them based on the Defiant class as the Federation needed stronger ships. I’m surprised they didnt add ablative shields to the Enterprise E. It may have helped in the battle with the Scimitar. Though they did use up their torpedoes. Not the answer you're looking for? Browse other questions tagged star-trek star-trek-tng star-trek-ds9 uss-enterprise or ask your own question. Has the Defiant beaten any enemy ship comparable to a 'Galaxy Class' starship in single combat?